The Bunnyboy Scalzi design went smoothly, for a change. But then the real work began. That’s pretty much where we were stuck. Last to edit wins! 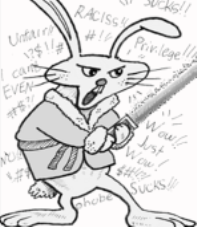 Poor, poor Scalzi Bunnyboy. In the midst of the crisis, inspiration struck, like a jolt of caffeine to an underslept amygdala. We here at Tempest in a Teardrop are proud to announce the world’s very first transnamed cartoon character: Bunnyboy Scalzi! Sadly, we cannot take credit for the transnamed concept. This honor goes to Mr. John C. Wright, whose Hugo-nominated novella One Bright Star to Guide Them features the transnamed Sarah/Sally character. Mr. Wright, we know you’ve underplayed this title, but once they realize your novella is even more socially just than transracial fiction they will immediately cancel the vote in this category and shoot you The Rocket! Remember: its tear-drop not tea-pot when you give your acceptance speech. The transnamed concept is so cutting-edge that some people cannot understand it. Until awareness grows, our good readers can expect to see Scalzi Bunnyboy in scripts when we need to encode the humor so only the “correct people” recognize it. Once the rabbit appears, look doubly-hard for bonus-ungood-wronglaughs. Coming Tomorrow: The Germ will make his debut!